This time of year, we’re all being inundated with emails from companies trying to get us to buy stuff from them. No one likes it, including me. But the reality is that this is the time of year when many businesses make most of the money they need to function the rest of the year… including me. 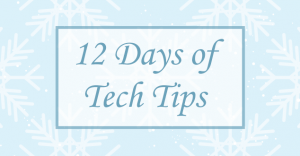 So to reconcile these two factors, instead of focusing on alerting readers to holiday deals this year, I thought I would instead honor the seasonal theme by posting a new tech tip a day for the next 12 days and just add related shopping information where it’s relevant. And to add a little more fun to the series, I thought I’d throw a couple of giveaways into the mix… Woo-hoo! When the series ends on December 15th, there will be a random drawing of everyone who has entered throughout the twelve days and the winner will receive an Amazon Fire TV Stick and Echo Dot Bundle! For this giveaway, you’ll receive one entry for every poll you’ve submitted, so if you submit all twelve of them, you’ll have twelve chances to win. The deadline to enter the daily draws is 11:59pm Eastern Time of the day the poll is posted. The deadline to enter the series giveaway is 11:59pm Eastern Time, Friday, December 15, 2017. Giveaway is open to anyone 18 years of age or older. No purchase necessary. Winners agree that Tech for Luddites may publish the following information about them on on any of its electronic or print marketing channels including, but not limited to, the Tech for Luddites blog, Facebook Page, Facebook Group, Twitter account, Instagram account, newsletter, Luddite Lounge podcast, etc. : first name, last initial, city, state, country. Shipping for the Fire TV/Echo Dot bundle will be paid by Tech for Luddites at the lowest rate available. If the winner resides in a location where the prize cannot be shipped by Amazon, winner will receive a $70 USD Amazon e-gift card in its place. If you live in a place where it’s illegal to enter online contests, I’m sure that’s been a pain in your a$$ your whole life so you already know you shouldn’t enter. By submitting your response to any of the polls, you are attesting that you are eligible to participate. Entering the contest will not add you to any other mailings unless you specifically opt in to one. Tech for Luddites is not responsible for entries not being received or any other errors due to technical issues.